I have spent most of the Easter period visiting pubs and restaurants around the UK to taste the wide range of food on offer to tourists and holidaymakers. There is, without doubt, a range of British food that will surprise those who suggest food in the UK lacks variety, taste and invention. However, one thing that struck me as being a big concern, is the noticeable addition of dogs to our restaurants and pubs where food is served. And I don't mean on the menu! 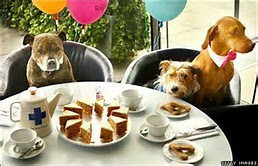 Suddenly, welcoming dogs with their owners to eateries has become a common practice that needs debate. I must admit to not being much of a dog lover, so the thought of dogs near my table for dinner, is a big turn off. But from what I have seen over the last two weeks, more restaurateurs are welcoming these animals alongside their owners for a meal. A well known restaurant in Stratford-Upon-Avon, for example, allowed a couple and their two dogs to enjoy a Sunday roast, across the aisle from me. The waiter even brought a couple of dog bowls of water for the creatures to lap at, as they sat there under their master's table being fed from the couple's plate. In another famous pub, opposite the Royal Shakespeare Theatre, that serves a fine array of pub grub, I saw two little dogs actually sitting at the table between the family, occasionally hoping on to an owners knee to take a taste of the roast beef. 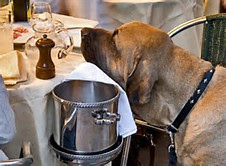 In the same hostelry, two tremendously large gun dogs were dragged in to take up most of the floor space between tables of eating patrons and then wait while their master ordered his fish and chips - feeding the slobbering giants with snippets of cod. What is happening in our UK restaurants and pubs? I cannot explain the thinking behind such unhygienic practice and what's more, restaurants are NOT advertising their 'dog-loving policy'. I only saw one sign in two weeks of journeying that said 'Dogs Welcome With Their Well Behaved Owners'. Everywhere else I came across dogs at, under or on the table, there was no such warning. Surely restaurateurs and landlords owe it to all of us, but particularly non-doggy fans, to tell us their policy. Not that it will make much difference, I suspect. With the growth in 'designer dogs' it seems easier now to smuggle-in your pooch in your handbag and unless the waiter has the confidence to tell its owner their policy, the 'little rat' can taste the smoked salmon on their owners plate without being fear of being sent outside. Apparently there is no law in the UK that prevents animals entering catering establishments. It's up to the owners of such places. A Glass of French, Spanish or Chinese? Table For Two - At Waitrose!